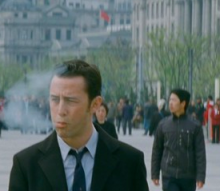 Contrary to initial reports, the sci-fi movie Looper did not become the first film to open in China with a bigger gross than it brought in in the U.S., Nikki Finke reported on her Deadline.com blog on Wednesday. Finke claimed that some of the Chinese theaters “mixed up dollars with yuan, making the tally appear much bigger than it actually was.” In fact, Finke, citing unnamed sources, said that far from taking in $23-25 million on its opening weekend in China, it actually earned just $5-7 million. She cited a China film blog as saying the actual gross was more like $4-5 million. Commenting on her report, Britain’s Guardian newspaper observed, “Such a dramatic turnaround, at the very least, highlights the fledgling nature of box-office reporting in China in comparison with the US, where grosses have been a part of the Hollywood conversation ever since films such as Jaws and Star Wars ushered in the blockbuster era in the mid-1970s.” Nevertheless, there was no official corroboration of Finke’s report. The country this week is celebrating National Day Golden Week — a week-long national holiday.